Imagine walking down a city street and feeling that familiar buzz of a push notification. But instead of it being a notification on Twitter or a restaurant recommendation, it’s a beautiful passage from a work of literature with a tie to that place. In Paris, it could be walking past Café de Flore and receiving a sample from James Baldwin or Richard Wright. In Washington, DC, it could be a sample of an Alex Cross novel. In Japan, it could be one of Miyuke Miyabe’s mystery novels. In Chicago, it could be a bit from Devil in the White City. 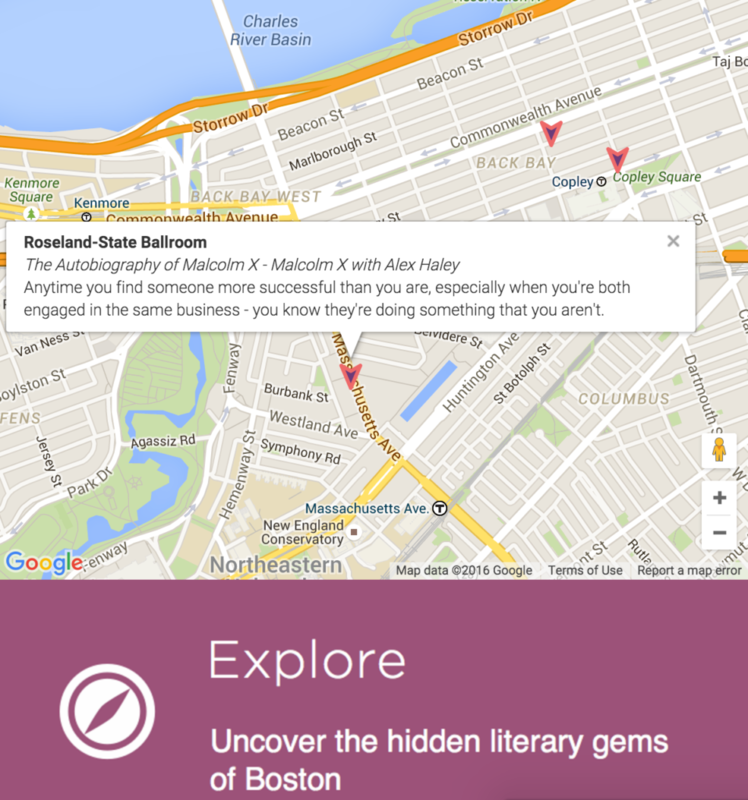 LitCity ties literature and place, injecting a little bit of romance and geographic discovery into books. Not only is the reader given a beautiful prompt to reflect upon (contributing to the mental environment) but it also is a reminder that literature lives wherever we are. The LitCity prototype was developed at the Codex MIT hackathon as a mobile web application, using a combination of natural language processing, scraping, and web APIs to create and connect books, places, and quotations, along with a Django-based admin interface that allows editors to approve and adjust the automated data. The prototype was developed for Boston and London. The source code is available on GitHub.